American manned lunar base. Study 1992. The First Lunar Outpost was a very comprehensive moon base study carried out by NASA's Office of Exploration in 1992. The "First Lunar Outpost" (FLO) was a very comprehensive moon base study carried out by NASA's Office of Exploration in 1992. FLO was intended as a benchmark "reference mission" against which competing proposals and alternative strategies could be measured. The FLO concept incorporated many recommendations from the 1991 Stafford Synthesis report, such as development of an extremely large launch vehicle and minimized assembly operations in Earth orbit and on the lunar surface. In many ways, FLO represented a radical departure from NASA's previous plans since the lunar spacecraft were fully expendable. The goal was now to develop a limited number of large but simple launchers and spacecraft while maximizing inheritance from previous projects (Apollo, Space Station) to reduce costs and development time (the first unmanned launch was scheduled for 2000). In contrast, virtually all plans since Apollo had been based on reusable lunar spacecraft that would be assembled, refueled and serviced at a space station in Earth orbit. As recommended by the Stafford Synthesis report, the manned lunar vehicles would be launched by a single large rocket with no need for in-orbit assembly at Space Station Freedom (early FLO trade studies also investigated a dual-launch scheme where the spacecraft and translunar injection rocket stage would have been launched separately into Earth orbit on Saturn V-class rockets; the vehicles would then rendezvous and dock, and then the TLI stage launches the spacecraft toward the moon). The resulting The "Comet" heavy launch vehicle was a true behemoth capable of injecting a 254.4-metric ton payload into low Earth orbit and 97.6t toward the Moon -- twice as much as the old Apollo Saturn V moon rocket. NASA's Marshall Space Flight Center investigated two different options: the Comet configuration and a derivative of the 1991 "National Launch System" concept with four F-1A boosters added to the basic 2-stage NLS vehicle. The liftoff thrust would be 74,000KN vs. 72,000KN for the Saturn V- derived option. 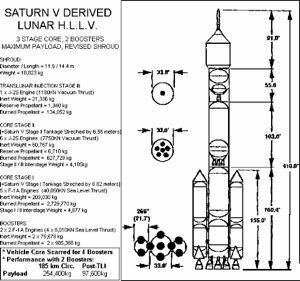 The Saturn V-derived heavy lift launch vehicle (HLLV) option was basically a stretched version of the old Apollo moon rocket, with two strap-on boosters for additional performance. F-1A and J-2S engines would have been used on all stages of the rocket. The development cost savings were expected to be significant since most of the hardware concepts and systems already had been demonstrated in the Apollo program. The landing craft featured a scaled-up 4-man version of the Apollo CM crew capsule. 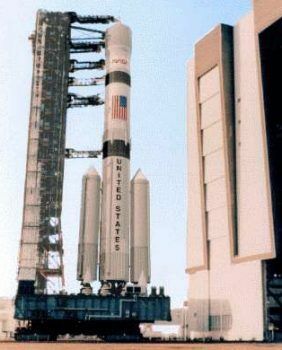 An alternate nuclear-powered version of the final rocket stage was also considered. Use of two 222.5KN-thrust nuclear engines would reduce the size and weight of the translunar injection stage while significantly reducing the size of the rest of the launch vehicle as well. However, the FLO baseline assumed a standard J-2S chemical engine would power the upper stage. The all-chemical version would cost about $2 billion less to develop than a nuclear translunar stage, but the latter option would be very useful for future manned missions to Mars. Boeing's Space Exploration Initiative contractor studies and the Stafford Synthesis report both recommended that NASA invest in nuclear propulsion technologies. NASA's Lewis Research Center had already established a Nuclear Propulsion Systems Office to develop a fully functional test engine by 2005. This program -- and the military "Timberwind" project -- revived the U.S. nuclear propulsion program, which had been dormant since 1972. The crew would jettison the spent final rocket stage after entering a lunar transfer trajectory. 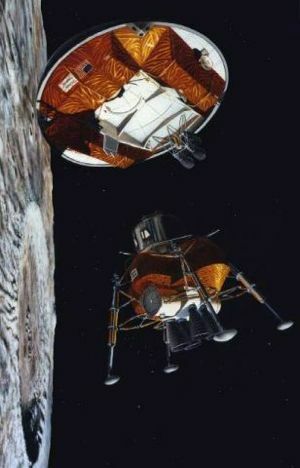 Three days later, the lander would fire its RL-10 engines to enter a lunar parking orbit. Unlike Apollo, the entire spacecraft (including Earth return capsule) would be landed on the Moon. The NASA designers settled for this configuration since it would enable the lunar crew to leave from landing sites in middle latitudes. Leaving the Earth return vehicle in lunar orbit would save weight, but the lunar lander would not be able to rendezvous with the mothership on some days due to unfavorable orbital mechanics. The preferred landing site was Mare Smythii, near the equator on the eastern limb of the Moon. The lander would stand 14.1 meters tall on the lunar surface. The other key element of the FLO plan was an unmanned cargo carrying lander. Both vehicles (manned and unmanned) would use the same basic lander stage consisting of four RL-10 engines modified for 4:1 throttling, propellant tankage and four landing legs. The one-way cargo lander would arrive before the crew with a habitat and consumables for a 45-day lunar stay. Each astronaut would make three 8-hour EVA "spacewalks" per week so new, comfortable spacesuits would be required. During their stay, the astronauts would also perform nine traverses within a 25-kilometer radius of the landing site. Like Apollo, the crew would use a lunar rover to explore the Moon: the FLO version would carry a crew of four or, alternatively, an unmanned 100-kilogram payload to 100km from base. The astronauts would deploy 3 metric tons of scientific equipment: a geophysical monitoring package, solar system physics package, geophysical package, lunar geologic tool set, lunar transit telescope, small solar telescope, robotic package for the rover, and a life science package. 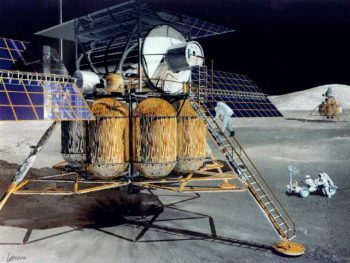 The crew would also demonstrate oxygen extraction techniques from the lunar soil, make bricks from in-situ materials and test pneumatic size sorting methods. The 35.9-metric ton $470-million 1992 $ habitat module was basically a modified version of the standard Space Station Freedom lab/hab module design. Unlike previous NASA designs, no outfitting or construction would be required by the astronauts. The habitat self-deployed its 20KW solar arrays and radiators and self-checked its systems before the crew arrived. The module also served as a life science and lunar soil analysis laboratory. It could be visited by several crews at roughly six-month intervals after the end of the first 45-day mission. The follow-on expeditions could either expand the facility into a permanent moon base a la NASA's previous "90-day study" or demonstrate long duration manned spaceflight techniques required for sending humans to Mars. For safety and storage reasons, the Earth return propulsion stage utilized hypergolic (=self-igniting) propellants rather than oxygen and hydrogen. Three engines would be used for additional redundancy. The Apollo-derived crew capsule was 5% bigger than the 1960s original and carried 200kg of lunar soil samples in addition to the four crewmembers. Unlike Apollo, the capsule would touchdown on dry land and NASA planned to use the same design for its manned "Mars Semi-Direct" mission proposal as well. Prodded on by the new NASA Administrator, Dan Goldin, the Office of Exploration team tried to avoid the kind of ruinous costs that had doomed the previous 90-day Space Exploration Initiative study. The estimates were taken from independent analyses by James French and Kent Joosten/Lisa Guerra who both concluded that the total cost up to and including the first manned mission would be $24-25 billion at 1992 rates. The cost and schedule goals (a first unmanned landing by 2000) were undoubtedly aggressive, and NASA proposed a series of low-cost lunar precursor probes to demonstrate competence and more cost-effective management "paradigms" on a smaller scale before attempting to land men on the Moon. 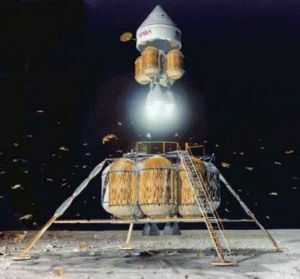 Although the technical analyses appeared quite reasonable, many critics disliked FLO because they felt the concept was too much like Apollo and that the key technologies (most notably the heavy lift launch rocket) would not be commercially useful except for manned lunar and Mars missions. What was there to keep this concept from running out of steam like Apollo did? Unfortunately, when NASA unveiled the FLO plan it was already too late to save President Bush's Space Exploration Initiative. The final unmanned lunar precursor missions were deleted from NASA's Fiscal 1993 budget and Dan Goldin closed down the Office of Space Exploration on March 25, 1993. Goldin (who had spent his first twelve months touting the benefits of a comprehensive lunar exploration program) now started to focus all resources on the Space Station, "cheaperfasterbetter" planetary space probes and -- eventually -- a manned flight to Mars as the "next logical step" in human spaceflight. Family: Lunar Bases, Moon. Country: USA. Agency: NASA.